These honey Sriracha Tofu sticks are crispy on the outside but silky soft on the inside. I expected these would have a bit of a kick to them but they were surprisingly spicy! In a good way of course. One of the things I love about tofu is how you can eat it by itself or combine it with a huge variety of dishes. I followed Pickled Plum's recipe. First off we want to prep the tofu. You'll need a few paper towels, a plate, 1 towel and something to press down onto the tofu without crushing it. I'm using another large plate. Pat down the tofu with paper towels. Then sandwich the tofu with 2 paper towels, and then wrap the towel around the paper towel/tofu bundle. After that, place everything on your plate and then put your weight on top. Over the next 30 minutes you'll want to let the water drain out of the tofu and swap out the paper towels once they're soaked. While waiting for the tofu to dry out, let's prep the sauce. Whisk together the garlic, sriracha, soy sauce, honey and rice vinegar in a bowl. Set aside for now. The tofu is ready! 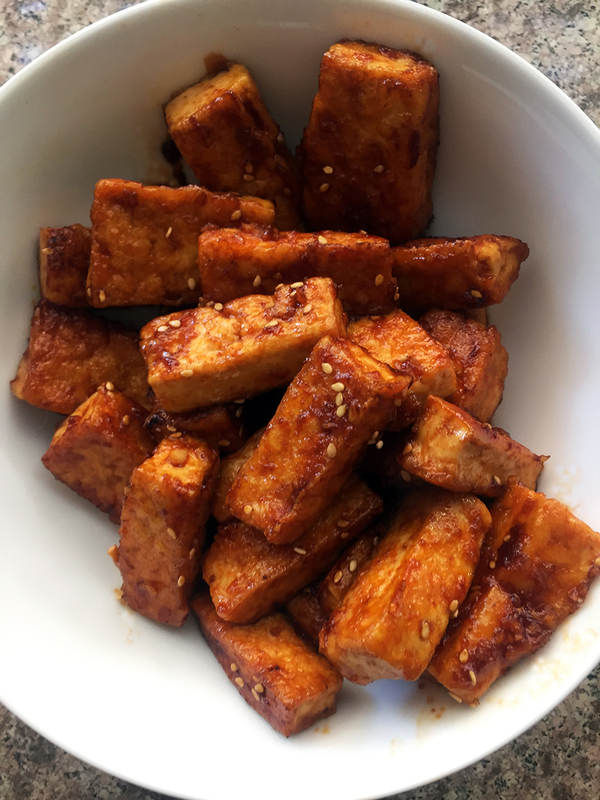 I sliced the tofu into 1 inch thick strips, but you can cube it if you'd like as well. For me, these are easier to flip over when cooking. Dust the tofu slices in corn starch and mix them up gently until all sides are coated. Turn the temperature to high and heat up the vegetable oil in a large pan. When the oil is just starting to smoke add in the tofu. I used a splatter guard to help manage the oil spits because it will absolutely hiss and spit as you add in the tofu! Let each side cook for 2-3 minutes or until golden brown. Drop the temperature to medium and add the sauce and mix around until all tofu pieces are coated. Cook the tofu for another 2-3 minutes. I kept the tofu moving for this to avoid burning. Turn the heat off and add your sesame oil and sesame seeds. Transfer the tofu to a plate and you are all set! You can have it with rice, by itself or in an open-faced burrito like I made below! Enjoy!